Homenewsmortgage newsWhat is a Land Contract and How Does it Work? If you have less than stellar credit you may be inclined to seek a land contract. But what is a land contract? Find out more, here. If you’re interested in buying a home with less than perfect credit, you may consider a land contract. Likewise, if you are a seller, offering a land contract is a great way to attract potential buyers. But, what is a land contract? Perhaps you’ve heard the term in your journey to buy or sell but haven’t learned the logistics yet. That’s okay. We’ve got you covered. In this article, we’re discussing what a land contract is, how it works, and some pros and cons for both buyers and sellers. Our goal is to provide you with enough information to proceed with the process, no matter where you are in your journey. Keep reading to learn more. A land contract is a legal written document between a buyer and seller for the purchase of real estate such as land, a house, or other real property. It may be considered a form of seller financing in that the seller remains the owner of the property while the buyer makes payments to that owner. Each land contract form is different according to the specifications and terms and conditions laid out between the buyer and seller. Some of these specifications may include but are not limited to liabilities, responsibilities, and expectations of both parties. How Does a Real Estate Land Contract Work? Land contract homes and mortgages work similarly to a traditional mortgage. The buyer is responsible for making monthly payments until the loan is paid off in full. 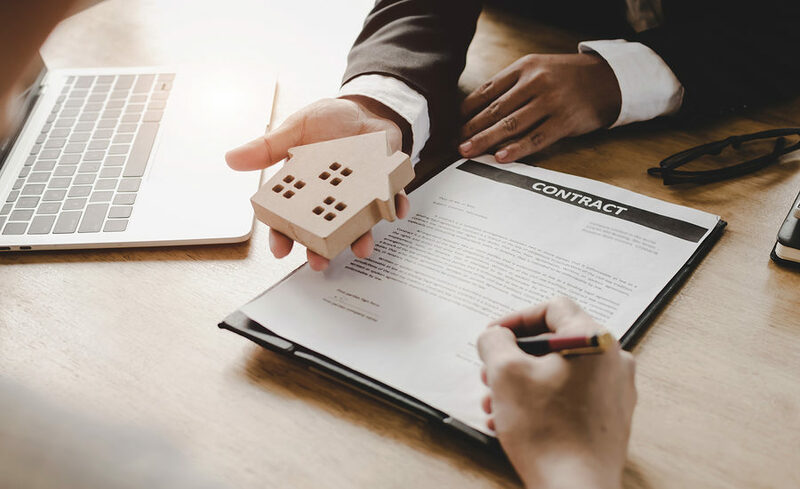 The main difference between a land contract loan and a standard loan is that the buyer often has the option of refinancing the mortgage to obtain a standard loan. This usually occurs after a period of 2 to 5 years, depending on credit history, debt to income, and other factors. During the time in which the buyer is financing the home with the seller, he or she has what is considered an ‘equitable title’ to the property. This ensures that the seller cannot sell the property to another party while under contract. Land contract terms can be especially beneficial to buyers. Not only does a land contract allow you to purchase a home, but often at better terms than what you may otherwise be eligible for with a bank. Depending on your credit score and financial situation, a land contract may be your only option. With that said, there may also be some drawbacks. Let’s take a look at the pros and cons of buying a home on a land contract. Perhaps the best incentive for buyers is the option to finance a property without traditional financing. It allows you to build a positive credit history that may qualify you for a new loan so that you can purchase the property outright. You may also have time to save up for a down payment and lower your debt-to-income ratio which can help you secure lower interest rates. A worst case scenario is when a seller does not own the property under question outright. If the buyer makes payments to the seller who in turn should be making payments to their lending institution but does not, it can lead to severe consequences including foreclosure. This leaves the buyer with a voided contract and nowhere to live, not to mention the loss of previous payments made. It may be a good idea to outline details pertaining to an issue of this nature in your contract to avoid problems in the future. Another problem that may affect buyers are mistakes in the contract. It’s important to decipher who will be responsible for things like maintenance, homeowner’s insurance, and other specifics. It’s also a good idea to have a disclaimer about what happens if you decide not to refinance the home into your own mortgage later. Buyers aren’t the only ones to benefit from a land sale contract. Sellers have equally as many benefits. Of course, we’ll talk about the pros and cons of this situation as well. A land contract may be considered most beneficial for a seller. It’s kind of like renting out your home for monthly payments that ends in a sale. If the buyer stops making payments, the seller has the right to evict them (as outlined in the contract). The property belongs to the seller as long as the buyer is making payments. If an eviction becomes necessary, the seller has the opportunity to do with the property what he or she so chooses. There is also a worst case scenario for sellers. If a buyer makes modifications to the property only to fail to secure a loan later, the seller may be left with an altered home. Likewise, if a buyer damages the home, the seller will have the responsibility of making repairs. Make sure to consider these issues when creating your land contract so there are no surprises later down the road. It’s a good idea to secure an attorney to handle the documents for you. The short answer to the question what is a land contract is that it’s a legal document between a seller and buyer for the purchase of a home. If you’re unsure whether this is the right type of agreement for your situation, you should consider your other options to be fair to all parties. Once you’re ready to pursue a loan, feel free to contact us! We have over two decades of experience and professional networks ready to help you obtain your dreams. It is our mission to provide the best possible service.